VertaseFLI was to install 95 linear metres of vertical root barrier at the former Armitage Shanks factory in Wolverhampton. VertaseFLI was already on site as the Principal Contractor overseeing activities associated with demolition and remediation, including the removal of Japanese Knotweed. Due to cross boundary infestation, a vertical root barrier (designed by VertaseFLI) was required by the client. Supply of plant, materials, labour and equipment, co-ordination of the works, supervision, training, haulage and disposal of rhizome contaminated soils. Excavate a 3.5m deep trench for the Knotweed barrier. Identification and removal of cross boundary rhizomes within the site. Validation of soil excavated to confirm free of rhizomes. Installation of 2mm HDPE liner used for vertical root barrier. Reinstatement of void with clean as dug material. Compaction to specification for highways. Forming concrete beam to top of root barrier. 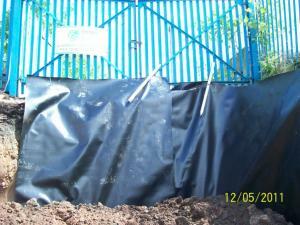 Sections of HDPE liner were rolled up and fixed to the boundary fencing. Each roll was held in place by a pull cord which enabled the rolls to be dropped in to the excavation. As the trench was excavated, another roll of liner was added, vertically under lapping the last by at least 1.5m. 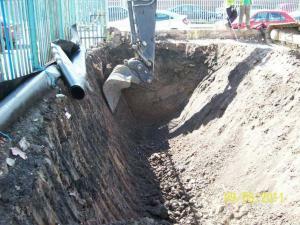 When the required 3.5m depth had been reached, the roll of HDPE liner was dropped into the excavation. As the excavation was dug, the walls of the excavation and arisings were inspected for rhizomes. The excavation was backfilled with clean as dug materials and compacted in 300mm layers. Formwork was installed and ready mix concrete paved to form a beam to the top of the liner. The beam secured the HDPE liner and also acted as a permanent indicator to the location of the barrier. All of the works were undertaken in close conjunction with the client’s consultant to enable works to be completed with minimum disruption to the client.